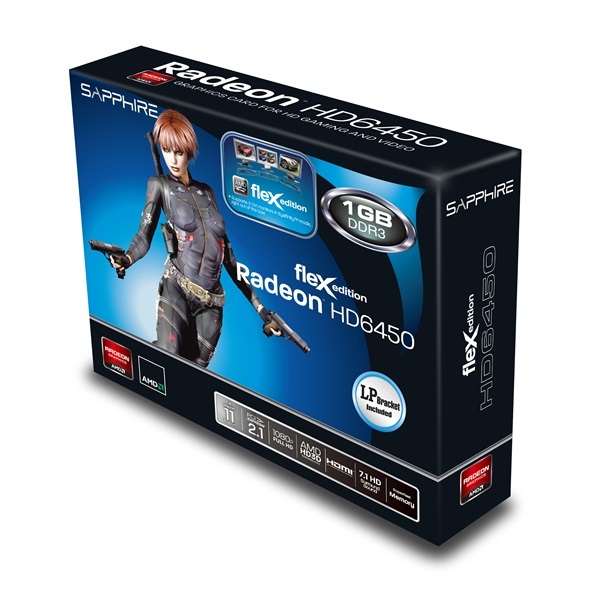 Today we will be taking a look at the Sapphire Radeon HD6450 flex edition. In addition to being a low-profile, silent media-PC-ready card, this unit also boasts triple DVI monitor support right out of the box. This is impressive for a sub-$100 card, but what kind of performance can something working in those constraints really provide? Their description claims this Radeon HD6450 is “the most cost-effective Eyefinity solution available for increased productivity in tasks such as editing or business applications,” leaving no illusions about the expectations of this card. This is designed to be a productivity workhorse supporting three low cost monitors out of the box; clearly we shouldn’t expect high-end gaming out of this card. Sapphire doesn’t even mention HD video. This low profile low power card sounds perfect for a workstation in an office.